For ages, we let Mother Nature do her thing and break down organic material into compost. We composted because everyone composted. Then we realized that compost is a little stinky and if we send it to the landfill we can just ignore it – compost was feeling really left out and uncool. Now we’re realizing that we’ve been fools all along. Sure your food scraps are a little stinky (and brace face might have been “uncool”) but it doesn’t mean it’s not worth your time. Composting may have been off our radar for a while but it’s back and hot damn-it’s cool. Admittedly, analogies are not my strong suite but hopefully you get the drift. It’s time for us to adopt composting as commonplace. It’s not just for hippies and rural dwellers. If we’re not composting, we’re probably sending our food scraps (hopefully, just scraps. We’re eating all our edible food, right?!) to the landfill. What’s the difference if you put in a compost pile or the landfill? It will all decompose anyway, right? WRONG! You food scraps do not turn to compost in the landfill. In fact, because organic materials do not have enough oxygen to compost in the landfill they go through a process called anaerobic (without oxygen) decomposition. Anaerobic decomposition has a really nasty side effect – methane gas! Methane gas is a really potent green house gas – 30 times more potent then carbon dioxide. Have you heard about how cow farts are destroying our atmosphere? Yeah, this is the same gas. Sometimes methane is harvested from the landfill for energy, which is really expensive, inefficient, and a sad attempt to remedy/prevent the devastation to our planet. If we shift the way we look at our food scraps, view it as a resource rather then “waste”, then why the hell would we send these precious resources to a giant toxic whole in the ground? Save your soil and create a healthier planet by composting. You’re probably so moved my words that you’re thinking, “Wow compost is sooo cool! How do I get started?”. Well it’s your lucky day because I’m going to tell you that too. The lazy persons method: Throw your potato peels, carrot tops and onion skins in a pile in the backyard. This is stuff often called the “greens”, basically anything that is alive is rich in nitrogen and is considered “green”. Toss some carbon (dried leaves, paper, egg cartons) on top to keep the stink factor down and let Mother Nature do her thang. Carbon is often referred to as “browns” and ideally you will maintain a good balance of browns and green. Use common sense – don’t put this pile next to the front door. If you have woods, go a few steps past the edge of the trees and dump there. This way when the critters come (which they probably will) they are far enough away that they can enjoy the luxury of feasting on your leftovers without your interruption. Buy or build a composter: There are so many options out there. You can build a really simple pallet composter with 3 or 4 pallets screwed together. Soil savers and tumblers are a both popular options. I use a green cone, which doesn’t produce any compost but keeps odors in, keeps animal out and is happy to consume meat, dairy and bones. Speaking of meat, dairy and bones – this is a topic that causes a lot of concern and again calls for common sense. I wouldn’t recommend putting the turkey carcass from Thanksgiving dinner in your backyard compost. But that last slice of pepperoni and mold pizza? Yeah, toss that in the compost. Just add more of that invaluable carbon. The best solution to the meat in the compost conundrum? Eat less meat! For my urban dwelling friends, I have not forgotten about you. For those who can’t or won’t compost at home, Find a Composter will help you find a commercial composter near your home. Check with your composter to see what they are willing to take, grab a compost caddy – this could be a fancy caddy or a small bucket – and start separating your food from the trash. Scale the size of your compost caddy to how much food waste your household produces. It might take a while to get this right. If you can’t make it to your composter frequently, keep a small caddy in the kitchen and dump it in to a larger 5 gallon bucket. Bring the 5 gallon bucket when it’s full. 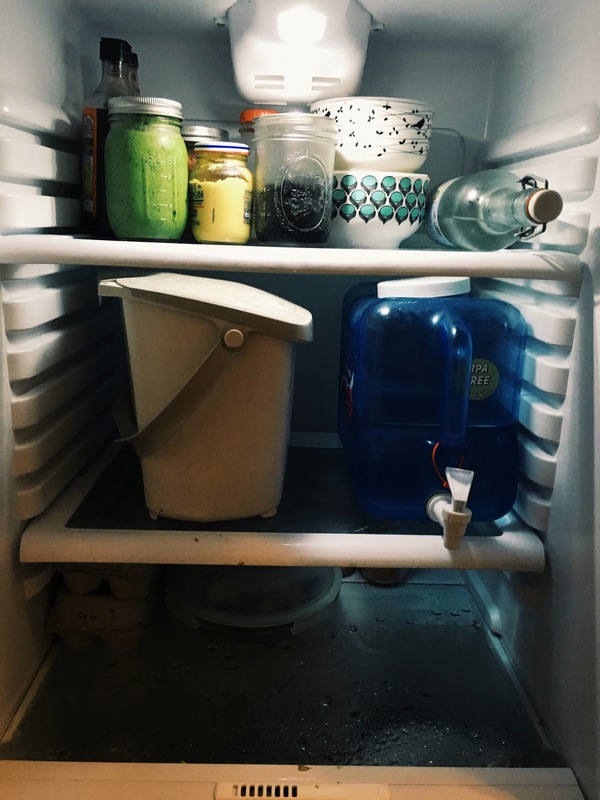 No one wants to keep a caddy of stinky food hanging around their kitchen, myself included – so I keep my caddy in the fridge. If you have the room, keeping it in the freezer is even better. If you don’t have room in the refrigerator or freezer, then keep it in a cool spot in the garage or basement (or closet if need be). There’s not much that is worse then hot, rotten food. A cool caddy is an odor free caddy! *Please know that I am aware of how terribly lame that closing sentence is but I’m sticking with it.